Vitamin D is a vitamin naturally present in a small number of foods. It may be added to other foods that do not originally contain vitamin D, or found as a dietary supplement. Vitamin D can also be produced in the body when ultraviolet rays from the sun penetrate the skin, in turn triggering its synthesis. Very few natural food sources of vitamin D have been identified. The flesh of fatty fish, like tuna, salmon, and mackerel, and fish liver oils are among the top sources. For instance, salmon contains more than the daily value in just one serving. Sardines contain 40% of your daily value, and tuna contains 25%. A study at The Boston University School of Medicine in 2006 found that farmed fish contained only about 25% of the vitamin D that was found in ‘wild caught’ salmon. These findings created useful guidelines for choosing salmon from wild sources rather than farmed sources. Trace amounts of vitamin D can be found in cheese (swiss), egg yolks, and beef liver; these foods contain vitamin D3. Pasture raised eggs contain about 10% of the daily value recommended. Other foods with vitamin D include certain mushrooms, such as shiitakes, which provide vitamin D2 in inconsistent quantities, but contain about 5% of the daily value. A large source of vitamin D obtained in the American diet is found in fortified foods. Fortified foods mean that vitamins and minerals have been added to the foods, which was not originally present in them. The most common example is that almost all of the milk supply in the U.S. is fortified with vitamin D. One eight-ounce glass contains about 25% of your daily value of vitamin D. However, other products that contain milk, like cheese and ice cream, are normally not fortified. Breakfast cereals often contain added vitamin D, as well as certain orange juice brands, yogurt, and margarine. Vitamin D supports calcium absorption in the stomach and sustains acceptable calcium levels to permit bone mineralization. It is also necessary for bone growth and remodeling. The absence of proper amounts of this vitamin can cause bones to become brittle, thin, or misshapen. In conjunction with calcium, vitamin D aids in protecting older adults from developing osteoporosis. Besides its involvement in bone health, other vitamin D benefits include regulating cell growth, neuromuscular, and immune function, as well as reducing inflammation. The National Academy of Sciences recommended in 2010 that adult males and females maintain a daily intake of 600 IU or 15 grams of vitamin D, with infants requiring slightly less (400 IU or 10 grams) and the elderly adults requiring more (800 IU or 20 grams). Since vitamin D can only be found in very limited sources, it is essential to gain an awareness of your current intake level to prevent vitamin D deficiency and associated diseases from developing. With very few options to choose from, incorporating vitamin D foods, like fatty fish and milk, into your diet might actually be easier than you think. If you are concerned about your vitamin D intake level from natural and fortified sources, talk to an expert about whether supplemental vitamin D can be used to better fit your needs. Ross AC, Taylor CL, Yaktine AL, Del Valle HB. Dietary Reference Intakes for Calcium and Vitamin D. National Academies Press. 2011. Chen TC, Chimeh F, Lu Z, Mathieu J, Person KS, Zhang A, Kohn N, Martinello S, Berkowitz R, Holick MF. Factors that influence the cutaneous synthesis and dietary sources of vitamin D. Archives of Biochemistry and Biophysics. 2007;460(2):213-217. Chen, T. C., Chimeh, F., Lu, Z., Mathieu, J., Person, K. S., Zhang, A., ... & Holick, M. F. (2007). Factors that influence the cutaneous synthesis and dietary sources of vitamin D. Archives of biochemistry and biophysics, 460(2), 213-217. Faulkner, H., Hussein, A., Foran, M., & Szijarto, L. (2000). A survey of vitamin A and D contents of fortified fluid milk in Ontario. Journal of dairy science, 83(6), 1210-1216. Huang, M., LaLuzerne, P., Winters, D., & Sullivan, D. (2009). Measurement of vitamin D in foods and nutritional supplements by liquid chromatography/tandem mass spectrometry. Journal of AOAC International, 92(5), 1327-1335. Ostermeyer, U., & Schmidt, T. (2006). 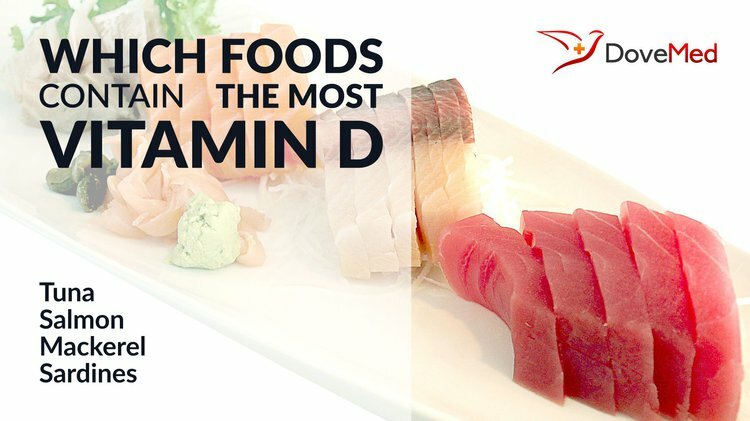 Vitamin D and provitamin D in fish. European Food Research and Technology, 222(3-4), 403-413. Jakobsen, J., Clausen, I., Leth, T., & Ovesen, L. (2004). A new method for the determination of vitamin D 3 and 25-hydroxyvitamin D 3 in meat. Journal of food composition and analysis, 17(6), 777-787. Keegan, R. J. H., Lu, Z., Bogusz, J. M., Williams, J. E., & Holick, M. F. (2013). Photobiology of vitamin D in mushrooms and its bioavailability in humans. Dermato-endocrinology, 5(1), 165-176.